Take two friends in serious need of some TLC and an afternoon at Fletcher’s Cottage Spa and you have a marriage made in heaven. I’d been a couple of times before and so knew what was coming, but my girl-in-the-know friend Claire, hadn’t even heard of it. We both live in Edinburgh and, much as we love the place, there’s something blissful about heading 40 minutes along the A1 towards East Lothian. As you glimpse the sea and can see Edinburgh in the distance, you can feel your shoulders dropping, and in my case, an eager sense of anticipation of what was to come, especially as it was a Tuesday afternoon and I’d normally be at my desk. Oh joy! As soon as you turn into the gates at Archerfield, you know you’re in for something special. 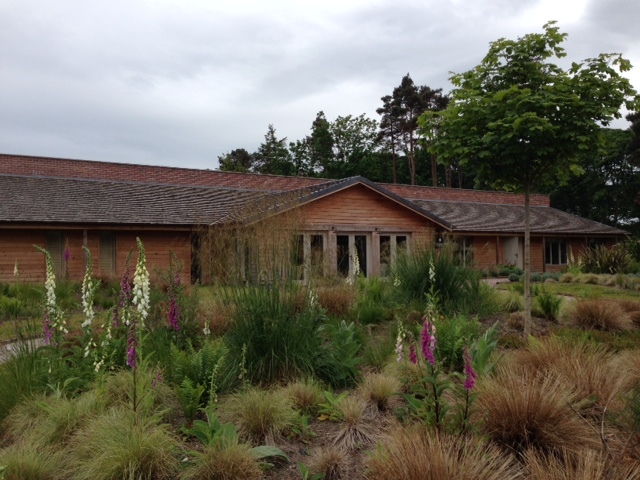 We started with a light lunch at Archerfield Walled Garden which is a fab family-friendly (play fort in a secure garden next to the restaurant) café, deli, gift shop and brewery. We didn’t hang about this time, wanting to maximise our time in slippers and towelling robes. Fluffy slippers, towelling robes, huge, comfy sofas and piles of magazines. Heaven! We arrived at Fletcher’s Cottage Spa and quickly ditched our shoes for fluffy slippers. As we sipped on a carrot and ginger juice, we filled in a form asking what results we were looking for with our skin. Surely, it would be too much to ask to feel glowing? Claire and I LOVE a well-executed interior and Sian Parry Jones has done a superb job. The spa feels very luxurious (think bleached wood, sheepskin cushions, pale shades and a nod to France) and ticks every box for those wanting to grab a pile of magazines and interiors books and slump onto a gorgeous sofa while you wait for your treatment. All the main spaces look onto a beautifully planted, walled garden and, as we were there in June, it was in full bloom and looking gorgeous. The first huge treat is that you get your own, fabulously appointed bathroom to change in. No horrid, steamy communal changing rooms here. There’s a steam room and a sauna, but coddled in our towelling robes, we found that the two huge and dangerously comfortable armchairs in the relaxation room overlooking the garden were free and had our names on them. A smiling member of staff came to let us know that our bath treatments were ready. The two private bath huts in the garden don’t look particularly special, but oh my, once inside they are an absolute luxurious delight and take the simple art of taking a bath to a whole new height. 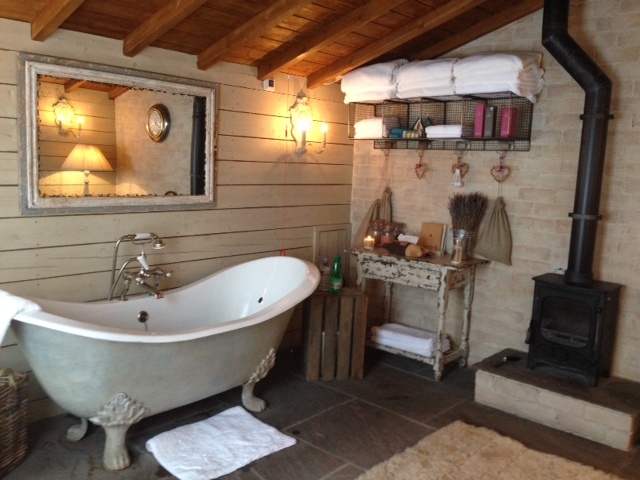 There’s a roll top bath, a wood-burning stove, music, a sofa and sheepskin cushions. We’d both opted for a detoxifying seaweed bath and were allowed to stay in the bath for up to half an hour. It takes moments to get used to the fact that you’re lying in a bath full of seaweed, before you lie back, close your eyes and drift off into a parallel universe where, in my case, you plan how you can build a child-free bathhouse just like this one in your back garden…… Suddenly half an hour has gone by and you drift back to reality. Your skin feels incredible after this treatment and with suitable cries of ‘Gosh, that was blissful’ we were collected and taken to our massage rooms. The treatment rooms are beautiful and most face onto the garden. The beds have warmed duvets and while I soaked my feet in warm water, Hayley (who was a brilliant masseuse) explained the treatment. We’d chosen the Voya full body and facial treatment, which at £70 (including two hours use of the spa) felt very reasonably priced. Voya products are all based on organic seaweed which is harvested by hand, by three generations of the Walton family on Ireland’s Northwest coast. The products are healing, detoxifying and nourishing. The treatment was amazing. Our bodies were brushed, massaged and sprinkled with oil and finished with a rejuvenating facial. It was one of the best treatments I’ve ever had, if not the best. We lingered on the sofas again, to enjoy a cup of tea (champagne is available too) before heading home and back to reality. We left the oils on our skin to do their magic and were promised a brilliant night’s sleep. As we drove back to Edinburgh, we reflected on what a gorgeously spoiling afternoon we’d had. We felt pampered, relaxed, inspired and, miracle of miracles, glowing! Thank you Fletcher’s Cottage Spa for being just 40 minutes from Edinburgh. We love you and we’ll be back. Get a fabulous apartment to go with your relaxing treatment! Dickins has beautifully decorated apartments across Edinburgh that will go perfectly with a day at Fletcher’s Cottage Spa. Search our properties to find your perfect home from home!